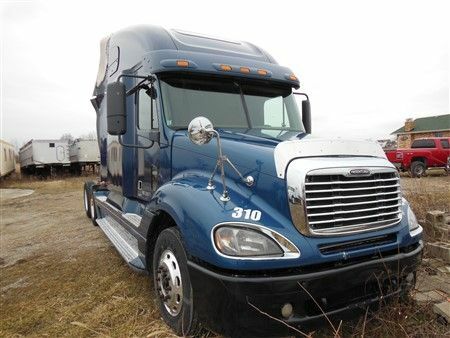 Semi’s, Trucks, Auto’s: FREIGHTLINER COLUMBIA Semi Tractor with sleeper Heritage Edition, Tandem Dual, Fontaine no-slack II hitch plate, Detroit Series 60, MFG: 10/06, double bunk, standard transmission, cruise; FREIGHTLINER FL70 Straight Truck, Push button automatic, drop rear axle with sleeper, MFG: 09/99, miles showing 452,226; VOLVO Semi Tractor with sleeper, MFG:06’, Detroit Series 60, Tandem dual axle; FREIGHTLINER Refrigerated Box Truck, MFG: 06/05, Cat C7 Acert, Standard, Johnson Truck Bodies & Carrier Genesis R90 refrigeration unit, dolly loading ramp; FREIGHTLINER Box Truck, MFG: 04/05, Cat C7 Acert, Split bench seat, automatic, Morgan Box, Dolly loading ramps, roll up door; CHEVROLET C4500 Duramax Diesel, flat bed with gooseneck hitch, Super Cab 4 Door, Allison Transmission, Leather Loaded, Grill Guard; DODGE RAM 1500 Big Horn Edition Pickup, 5.7 Hemi, 4 x 4, 4 Door; FORD F-150 XLT Ext. Cab Pickup, Long Bed, Tool Box, Black in color, 4 x 4, truck overheats; PONTIAC Grand Prix GT, MFG: 2/00, Automatic, Power windows/locks; KIA Sephia “For Parts Only” No Title, MFG: 3/22/01 does not run; FORD ECONOLINE Conversion Van with Handi-cap style ramp and lift. Trailers/Truck Bed: (2) TI-BROOK Frameless Dump Trailers, Apx. 39’, Tandem Dual with tarps; BENSON INTERNATIONAL Frameless Dump Trailer, Apx. 39’, Tandem Dual; TI-BROOK Frameless Dump Trailer, apx. 39’ “Salvaged Title”, side boards, updated brakes, wheels & tires; Apx. 18 ft. Steel Frame wood deck with backstop truck bed; Office Trailer Apx. 12’ by 65’ with bathroom and office “No Title”. Fork Truck: CLARK Fork Truck Model: C500Y60, Apx. 6,000 lb. lift, 3 stage, dual front wheels, hard tires, Type: LPG currently running on gas, showing 3,987 hours. 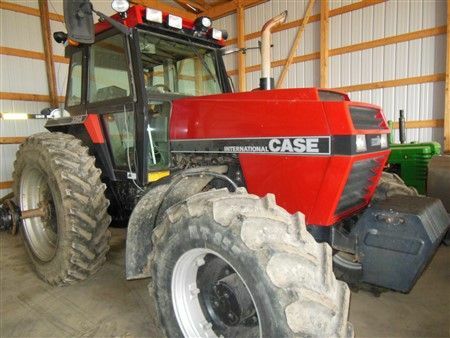 Tractors: CASE IH 3394 MFWD Tractor showing 4,979 hours, cab, A/C, Radio, Clean Tractor; A set of duals used with Case 3394; KUBOTA Utility Special M5400 Tractor, Turf Tires, showing 2,411 hours; MINNEAPOLIS MOLINE UTU, UT-100D, Pto; JOHN DEERE “B”, PTO; CASE VAC Model Vac-14, PTO. Planters/Drills: JOHN DEERE 7000 16 Row Planter, No-Till, markers, fertilize, monitor/boxes; JOHN DEERE 7000 4 Row Planter; JOHN DEERE 750 Double 15’ Drills, No-Till, Markers, Houck Hitch; ERSKINE HOUCK HITCH 750 Swing. Seed Runner: UNVERFERTH SEEDRUNNER 3750, Apx. 2012 Model, Tri-Axle, Honda GX340 Motor, remote, electric start, Nice Piece! Tillage Equipment: JOHN DEERE 712 Disc Chisel Plow, 11 Shank; INTERNATIONAL 490 Disc apx. 30’; DMI CRUMBLER Soil Finisher apx. 37’; KENT DISC VATOR Finishing Tillage Tool apx. 27. Frigidaire chest freezer; Aluminum wheel chair ramp and base apx. 20 ft.; Kenmore electric range; gas grill; Insignia & Emerson 32” flat screen TV’s; Kenmore series 70 washer/dryer; King size bed & dresser; Queen Bedroom Suite, bed, chest of drawers, dresser. Hospital/Handicap: Invacare bed model: BAR500IVC; Invacare wheel chair; Invacare reliant 450 medical lift. Implements: KING KUTTER Apx. 6 ft. Grater Box, 3 pt. ; Apx. 5 ft. PTO Rotary Mower, pull behind; Apx. 6 ft. Rotary Mower, PTO; “THE LEINBACH LINE” apx. 6 ft. Utility Disc, 3 Pt..
Fuel Tanks: Apx. 500 Gallon Portable Fuel Tank on skids, 12 Volt pump; Apx. 1,000 Gallon Fuel Tank with electric Gas Boy pump; Standing gravity flow fuel tank marked “Diesel”. Headache Racks: MERRITT Headache Rack with tool chest, aluminum diamond plate, 3 compartments, apx. 86” wide by 53” tall; MERRITT Headache Rack, aluminum diamond plate, apx. 86” wide by 53” tall. Tools: Robin-Air A/C Refrigeration recovery, recycling & recharging system model: 34700; 12 drawer, 1 door, 6 ft. wide by 38” tall tool chest; Craftsman top/bottom tool chest; Proto-Pro Tool Chest, 11 drawer; Campbell Hausfield 7.5 HP Air Compressor, 80 Gallon, 220 volt, 1 phase, 2 stage; Lincoln buzz box welder AC-225-5; Ratcheting chain binders; K-D tool torque wrench; Hi-Lift Handyman Jack; Acetylene torch kit & cart, Harris Gauges; Semi Transmission Jack; Shop Vacs; Craftsman work lights; RAM 21 pc. 1” socket wrench set; 5” bench vise; Rockwell benchtop drill press model 11-LCO; Rigid pipe wrench; Socket sets; wrenches; 4 ton High Powered Bodyu repair kit; Craftsman torque wrench ½” drive; 3/8” drive torque wrench; parts organizers; load jacks; Haul master 1,100 lb. elect. Hoist/remote; Werner 6’ fiberglass step ladder; sawhorses. Truck Wheels: (10) Steel Truck Wheels; (4) Aluminum 10 lug wheels; Misc. filters, brake shoes, parts, seats. Mower: Huskee Supreme riding mower SYT5000 in need of repair. Personal Property Terms: Terms: Paid in full at time of sale cash/check; removal the day of sale; Sold in As-Is condition with no warranties or guarantees; All information provided is to be utilized strictly as a guide; all sales final; Stanley & Son, Inc. and its agents are exclusive agents of the seller. Any announcements made only by the auctioneer from the podium during the time of auction will take precedence over any previously printed material and/or any other oral statements made or implied. Buyers are relying strictly on their own independent inspections, examination, investigation and inquires prior to bidding.